According to the Department of Labor, Janitors are the third most, non-fatally injured workers in the United States (based on 2015 data). While many cleaning organizations struggle to meet basic safety regulations, our SDS ‘Beyond Compliance‘ HazCom Program is designed to take organizations beyond the bare minimum of compliance. The process starts with color-coding. Every cleaning chemical is color-coded so that employees can see at a glance whether or not they have the right chemical for the job. This is especially helpful for employees who struggle with literacy or who do not speak English. Every bottle is labeled and every label is correct. Matching the chemicals is a color-coded Safety Data Sheet. The SDS ‘Beyond Compliance’ program dramatically reduces the amounts of chemicals most organizations use. 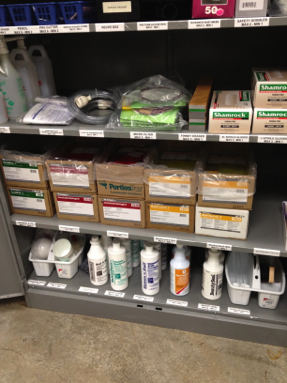 Pre-measured chemical packets are stored in highly visible wall mount stations. The compact nature of these cabinets, combined with the exact measure of portion controlled packages, limits the amount of hazardous chemicals in use. Hazardous materials inventory becomes almost automatic. The only chemicals on site are those specified by (OS1). Training your employees on how to identify hazardous materials, proper protective equipment and procedures, the Rule of One, how to read SDS sheets, safe materials handling and the proper response to non-routine situations is key. This is a typical looking “control cabinet” which is part of the (OS1) logistic system.